There are two approaches when it comes to investing: fundamental analysis and technical analysis. Today, I am going to explain to you what each one is. I will give my argument as to which one is superior in my eyes, but am hoping that you do your own research to determine which approach is best for you. In a nutshell, fundamental analysis involves analyzing a company’s financial statements. This allows you to see how the business is performing, such as, are sales increasing or decreasing, or have assets receivable increased or decreased, or looking at the difference in inventory levels over a few years’ time. You can then begin calculating ratios and comparing those to other firms within the same industry. This will give you something to compare the numbers against. You will be able to quickly see if the company you are analyzing is performing better or worse than its competition. From there, you move away from calculations and have to look more at the business as a whole as well as the economy. You may be looking at a company with strong financials, but it is in an industry that is evolving. For example, look back at Blackberry. They owned the Smartphone arena a few years ago. They focused solely on corporate clients. Apple and now Google entered the market and targeted consumers and slowly worked their way into corporate America. Now, Blackberry is struggling to survive. Another example is retail stocks after September 11. After the attacks, the markets dropped significantly. Everyone was selling. I bought some retailers because after looking at the numbers, realized that nothing had changed. They were still the same great companies; the stock price was just getting hit because of the fear in the markets. I bought a bunch of shares and turned a healthy profit a few years later. The point is that fundamental analysis includes both looking at the financials of the company as well as outside events to determine if a stock is a buy or not. Forget everything I just told you about fundamental analysis. None of it applies to technical analysis. Technical analysis is the process of studying the chart of the stock price of a company to determine if the stock is a buy or not. 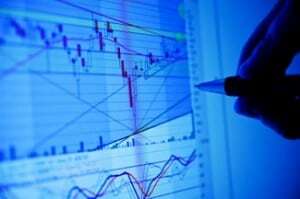 Technical analysts are often referred to as “chartists” because they study charts to find investments. They study the charts to look for market trends and patterns to determine when a stock is trading for less than it should be. Additional techniques used by technical analysts include moving averages, regressions, relative strength index, and business and market cycles. The belief is that emotions are present in the stock market and that the market repeats itself. By studying charts, the hope is to identify the points when history is going to repeat itself, act on it, and profit from it. Depending on who you talk to, you will get varying answers to this question. If you’ve read my other investing posts, you know that I lean more toward the fundamental analysis side. I do believe that emotion is involved in the market, but I don’t believe that studying a chart will help you to determine pattern. I fully believe that no one can predict the market and as such, you are better off taking what the market gives you. That is not to say that you cannot make money by using technical analysis. But I feel that the money made by doing technical analysis is more chance than actually predicting what happened. The debate rages on as to what is a better method. Readers, which method do you prefer when investing?